Industria cinematográfica,Moving Picture World, The,Picture Stories Magazine,Revistas cinematográficas,Solax Feature Co.
BLACHÉ SENDS COMPANY TO MEXICAN BORDER. 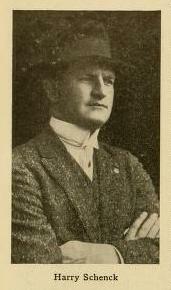 Under the experienced eye of Harry Schenck, former trumpeter of Troop D, Third Cavalry: vaudeville star, motion picture actor, director and born adventurer, Herbert Blaché has forwarded a large company including Vinnie Burns, Kenneth D. Harlan and Edgar De Pauw to Fort Clark, Texas, one of the important Mexican border posts. Director Schenck, who is armed with the scenario of a well-known war correspondent novel, the title of which is being jealously guarded at present writing, will be very much at home in the territory where the scenes of the picture are laid as he spent two years at Fort Clark. 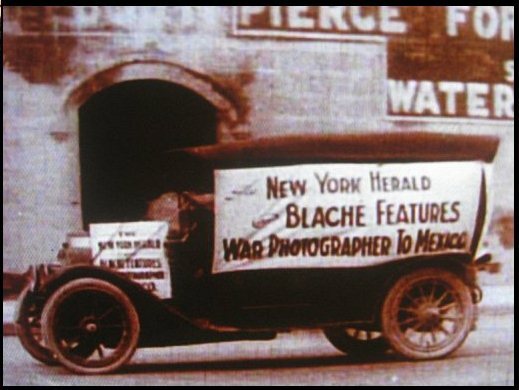 Mr. Blaché has formed a valuable connection with a cameraman now in Mexico City, who has forwarded 2700 feet of interesting war scenes to the Fort Lee studio and claims to have several hundred feet more ready for immediate shipment. This is for use in the war feature, which will also include special scenes staged at Fort Clark in which between eight and nine thousand United States soldiers will appear. Mexican War in Solax Features. Manager Joseph Shear, of Solax and Blaché Features, has returned from Mexico with Director Harry Schenck and a large company of Solax players, including Miss Vinnie Burns. Miss Burns proudly exhibits a bullet which ploughed up the ground within three feet of her, passing between her horse and the horse of Mr. Schenck, who rode beside her. The company entered Mexico by way of Eagle Pass, Texas, and made their way under a strong guard furnished by General Francisco Murguía of Villa’s army to Monclova. They not only succeeded in getting motion pictures of the battle of Monclova, but also several hundred feet of film showing the departure of trains loaded with the troops bound for Mexico City where the decisive battle of the war is in preparation. The stories they tell of the terrible sights they were compelled to witness easily explains the fact that no other motion picture company has ventured into the same locality. The company’s departure from Monclova was hastened by the punishment of two soldiers who were severely beaten for insulting the Americans. The insults were hurled at Director Schenck, whose inability to understand Spanish kept him in blissful ignorance of the affair until he was invited to witness the flogging of the culprits with the flat of a sword. The news of this incident caused such bitter feeling that the company was placed upon a special train and escorted across the border into Texas. Several days were then spent in making scenes in which Mexican and American cowboys posed in battle scenes staged especially for the benefit of the camera. Two of the Mexicans became enraged because the story called for their capture by the Americans and fired their guns into the faces of their opponents. The guns were only loaded with blank cartridges, but the affair started a fight which took the combined diplomatic’ services of Manager Shear and Director Schenck to settle. 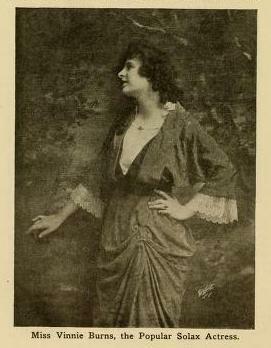 Miss Vinnie Burns is the only member of the company who is anxious to return to the land of strife. She brought back to the Fort Lee studios a little Mexican dog which bears the name of Jesus Carranza and says that as soon as she can have a rubber stamp made she is going to return to Mexico with a pad and a pen and make a million dollars in Mexican money. As a proof of the value of her scheme, she has a choice collection of Mexican legal tender (Constitutionalist) which any school girl ought to be able to make with the aid of a twenty-five cent rubber stamp. But as the million dollars “Mex” is only worth about two dollars and thirty-two cents (Broadway), making Mexican money is not as attractive as it might seem to the casual observer. Kenneth D. Harlan, who accompanied Harry Schenck, Charley Pin and Vinnie Burns into the heart of Mexico, playing the part of the cub reporter who witnessed the Battle of Monclova, has made arrangements with Madame Alice Blaché whereby he will be seen in coming Solax releases. Dan Barker, the well-known comedian is also appearing before the camera under Madame Blaché’s direction. Manager Joseph Shear, of Solax and Blaché Features, has returned from Mexico with Director Harry Schenck, and a large company of Solax players, including Miss Vinnie Burns. Miss Burns proudly exhibits a bullet which ploughed up the ground within three feet of her, passing between her horse and the horse of Mr. Schenck, who rode beside her. The company entered Mexico by way of Eagle Pass, Texas, and made their way under a strong guard furnished by General Francisco Murguía, of Villa’s army to Monclova. They not only succeeded in getting motion pictures of the Battle of Monclova, but also several hundred feet of film showing the departure of trains loaded with troops bound for Mexico City, where the decisive battle of the war is in preparation. The stories they tell of the terrible sights they were compelled to witness easily explains the fact that no other motion picture company has ventured into the same locality.